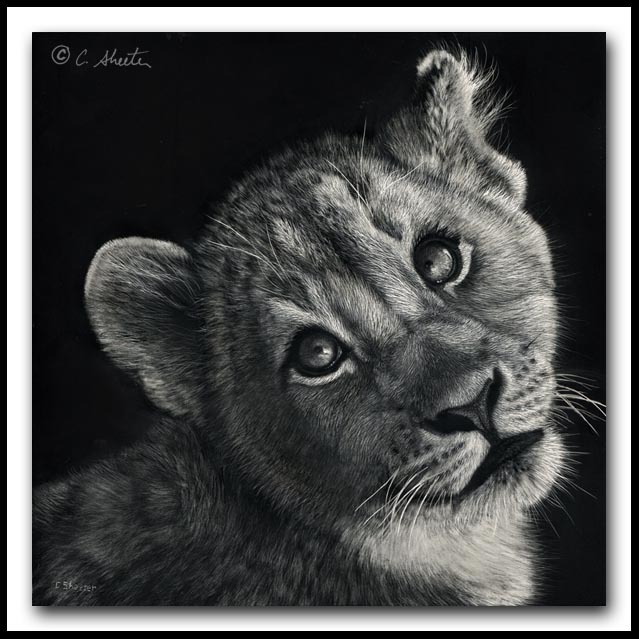 Scratchboard Art of Cathy Sheeter - "Dreaming Big"
This adorable three-month-old lion cub was one of a pair that my family actually got to hold in our laps and play with in South Africa at the Daniell Cheetah Project on our trip there in 2011. This cub and her brother will go on to become breeding animals to help sustain lion populations which have been declining steadily due to habitat loss and hunting. Lion populations have dwindled to around 20,000 from 450,000 in the 1940's. Many predict that lions will be extinct in the wild if things do not change. The title of the work "Dreaming Big" I hope reflects both that she will become a much larger cat and also that only with the vision and tremendous efforts to save the lion populations will this amazing species be able to be saved in the wild.